Beyond that, I helped EMULSIVE pioneer a new regular feature highlighting user reviews of cameras with my post Me and my Pentax 6×7. Take a look and maybe get in touch with EMULSIVE about contributing your own “me and my camera” review. Note: If it seems like I’m plugging EMULSIVE a lot, I probably am. They’re a relatively new player in the film photography blogosphere, but one I’m enjoying heartily. I’m more than happy to do what I can help out those who give so much, so freely, to this community that I love. 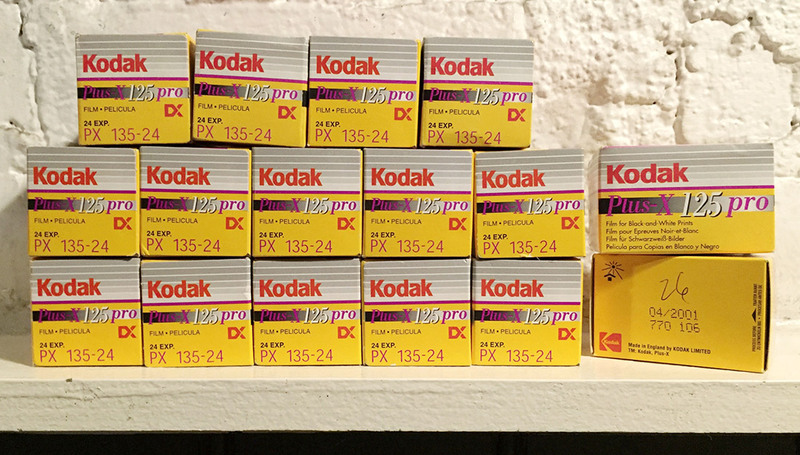 Just a quick recap: Expired Film Day is March 15. In advance of the event, there’s a giveaway featuring a ton of expired film — sign up for your chance to win some! After you shoot your expired film on March 15, you’ll have a full month to process and scan your film, and submit it to the gallery. You can submit up to three images, separately, and each carries a chance to win a prize. Awards are available from a half-dozen sponsors — each given for something different — as well as a few from the organizers. Check out the full Expired Film Day page for rules, regs, etc. Depending on how it has been stored, and how old it is, expired film can be perfectly fine, or exhibit varying degrees of underexposure or color shift (color shift is rare with black and white film, of course!). Typically you can compensate for some or all of the lost sensitivity by overexposing the film, or push-processing it, or a combination of both. You may be able to compensate for color shift with filters in some cases, but this is easiest if you have several rolls of the same film. Multiple rolls from the same source likely have been stored in the same manner, and probably all will exhibit roughly the same amount of lost sensitivity and type of color shift, so you can experiment and home in on what gives you a pleasing result. For roll (120/620/127/etc.) film: be aware that sometimes the inks used to mark backing paper can soak into the emulsion where the film rolls over itself on the spool, or coat the emulsion, acting like a filter. This can lead to localized color shifts or even legible markings on your film (I learned that using some 40-year-old Kodacolor in my Ansco Shur-Flash). Check the specs: You may or may not be able to develop some expired color films, depending on age. Kodakchrome’s famously-complicated K14 developing process is only the most recent casualty of advancement. In most cases it is no longer possible to process films designed for Ap-41, E-2, E-3 E-4, C-22, ECP-1, ECN-1, and other historic photographic processes, except perhaps as black-and-white, without the help of specialists like Film Rescue International (and maybe not even then). Most people’s rule of thumb to compensate for lost sensitivity is to rate the film one stop slower for every decade since it expired, assuming unknown storage conditions. 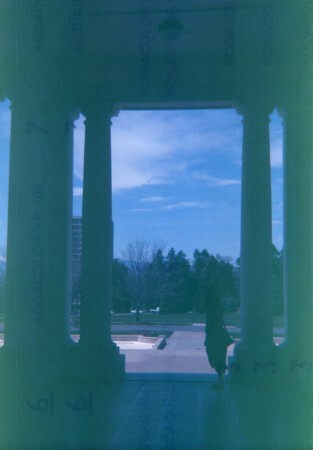 Thus, ASA 400 film that expired in 1985 would be rated at ASA 50 to improve the chances of getting usable exposures. If you’re going to use push-processing instead, simply push one stop for every decade (being aware that pushing can increase grain, among other things). If you’re on the fence between going 2 or 3 stops, or whatever, err on the side of overexposure — films generally handle too much light better than too little. Some people rate frozen or refrigerated film down by a lesser factor — half or one-third of a stop per decade. If the film was frozen, odds are you’re likely to have good performance on anything under about 30 years old. In addition to losses of sensitivity and color-shifts, really old film could be subject to fogging from background radiation. Kodak had a rash of complaints about fogged film after the Trinity test flooded the U.S. with increased levels of radiation, for example. The rules of thumb above may break down for films from the 1960s and earlier due to: a) the length of time to which they have ben subjected to normal background radiation, and b) the possibility that they were subjected to abnormally-increased background radiation from various nuclear tests in the 1950s and 1960s. Your results may be unusable, or even non-existent — plan accordingly (I’ll probably shoot half a dozen different films on March 15!). The uncertainty of film is attractive to many film photographers; using expired film simply multiplies that uncertainty by some factor that’s probably equivalent to about 1 over the number of years since it expired times the film speed, divided by the number of decades since it was produced. Or something. The most important thing to keep in mind during Expired Film Day is: Have fun! If you get crap, scan it and submit it anyway — we have awards for failure! We also have awards for what amounts to insanity, so push the limits if you like. Be sure to follow @ExpiredFilmDay for regular updates and announcements, and use or follow the hashtag #ExpiredFilmDay. Suggested hashtag use: Tweet photos of your best expired films or expired film results! #PrintItForward is like paying it forward, but with prints. In order to encourage people to print their work, photographer Shawn Mozmode will send three prints to three winners of this sorta-selfie competition. The three winners then each send three prints to three other people, and so on. Eventually, every film photographer on earth will have sent out three prints for every one they’ve received, every wall everywhere will be covered with silver gelatin prints, all plowshares will be turned into enlarger heads and the world’s currencies will be melted down to provide silver for more film and paper … (your results may vary). But seriously — get involved if you can commit to sending out three prints to people who can send out three prints. We’ll have a grand old time following them around the world, and it beats heck out of old-school chain letters. All you have to do is take a selfie on film and make a print. Easy peasy, right? Unfortunately, I don’t think I’m going to be able to participate in this one. Maybe someone will send me a print when I’m more ready to send out my own. I do hope to report soon that I’ve got a more-or-less working darkroom, however!